手 Forty-five years of ongoing study in traditional and modern martial arts. 手 Over Thirty Years teaching experience. 手 Black belts in Japanese Shotokan and Okinawan Shorin Ryu Seibukan Karate. 手 Certified instructor in Filipino Martial Arts. 手 Proficient in dozens of weapons, both classical and modern. 手 Founder of the FMSD system (Familiar Movement Self Defense). 手 Listed in Who's Who in American Martial Arts, third edition, 1987. 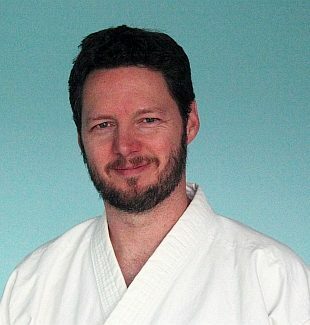 手 Author of Karate: Crash Course, 1991. 手 Instructor and Instructor Trainer for Young Champions Karate, 1998-2007. 手 Taijiquan, Qigong, and push-hands instructor. It doesn't matter if I'm teaching modern self-defense or a classical martial art, realism is of the utmost importance to me. I originally got into the martial arts for self defense, and as such, keep it real regardless of the system I teach or practice. I've made the martial arts a lifelong study, starting at the age of four in 1972. My studies have included many Chinese, Japanese, Korean, Filipino, Indonesian, European, Brazilian, and American martial art systems. After all of these years of training, I have specialized in a few different areas. In the summer of 1991, I published my own book as a reference guide for a course I was teaching through Colorado Free University. I am currently working on a new book based on the many lessons I have learned in all these years of training. I strive to dispel the myths and misconceptions associated with martial arts and deliver the truth in an easy to understand method. I'm currently only teaching private karate lessons, and bi-weekly and private Tai Chi lessons. See also my personal website for more information. All Content Copyright © 2014-2019 Old School Karate LLC, All Rights Reserved. Layout and Design by Kirk Ireson.